I achieved my goals and then some! Winning my class! It was during my holiday in South America late last year that I first decided to compete in a bodybuilding show. I had always had a passion for health and fitness and had been involved in things such as running, crossfit, horse riding and netball before discovering a love for working out. I was going to need someone to help me get there. I started researching online prep coaches, and was recommended to Johanna Mountfort through word of mouth. After booking to meet her I flew up to Auckland to meet her. I told her about my goals and ambitions and that same very day locked in dates for my first competition. I walked away feeling like everything was real, this wasn’t something I was just talking about, this was something that was going to happen. Within a few days I had my first training program. Every program from then on was created with the purpose of presenting the best possible package I could come stage time. The programs were always fully explained in detail and she ensured I was educated about the reasoning for everything she asked me to do so I could understand it better, making it so much easier to follow. Jo is always reliable in terms of getting me my programs and communicates frequently with me on her own accord. The vast amount of knowledge and experience she has rubbed off on me and installed confidence in me that I could actually achieve my goals. The main thing I am grateful for is the relationship that Jo and I have created. She doesn’t just treat me like a client, more like a friend, and her genuine care for myself and all the rest of her clients is obvious. There is also unrivalled team unity on Jo’s team, with incredible support from everyone, no matter what stage they are on in their own journeys. Her expertise in Bodybuilding Posing for Bikini Class was also very helpful as this was something I had never had to do before! 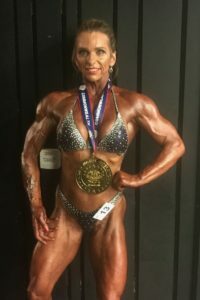 I achieved my goals and then some, winning my class at the NABBA/WFF Wellington champs- my first show before going on to place third at the federations national championships. This exceeded all my expectations! The amount I achieved throughout my first prep with Jo was almost unbelievable. I had grown so much, not just physically, but mentally too. Not only had I achieved my goal of getting on stage, I had learnt so much and found the lifestyle that I want to continue to follow moving forward. I pushed myself to places I had never been before, trained when I didn’t think I could train anymore, stuck to diet plans even when times got hard and learnt so many skills that I can now apply to the rest of my life. I cannot thank Jo enough for shaping me into a strong confident women through my passion for bodybuilding. I was given the honour of being chosen as one of Jo’s new sponsored athletes for 2019, something I am so grateful for and proud of. I am now a few weeks into my off season and I am more motivated than ever to improve. I know exactly what I need to do and Jo has put the plans in place to ensure that 2019 will be even better! Johanna is by far the best coach I have worked with! She keeps me challenged and motivated, and always wants what is best for her clients. With her support, programmes, and posing routine, I competed in my first figure competition and felt amazing! My transformation was beyond my own expectations! Johanna turned me from an amateur to an athlete of an international standard! 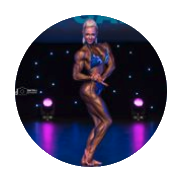 I came to Johanna looking for posing advice and a routine for my 2018 competitions. Thank god I did, she turned me from an amateur to an athlete of an international standard! She knew the best poses to suit my body to show to the judges, which gave me the confidence I needed to get to the next level. The skype and step by step posing routine was just so easy to learn, I highly recommend this. Our skype online posing was invaluable also, giving me the necessary tweaks to perfect my posing before comp day. I am so indebted to Jo for all the valuable sessions this year, she is a great mentor and coach – highly recommended for anybody whether starting out or a seasoned competitor. I won my class and my Pro card!! I contacted Johanna for help after I met a competitor client of Johanna’s backstage. She looked amazing and had made significant progress in a very short amount of time. Within 5 weeks of working with Johanna I competed in a show and won my class and the overall bikini title. 10 weeks later I competed again in a Pro/amateur show. I won my class and my Pro card!! Since then I have competed in 3 Pro bikini shows placing 4th, 5th and 2nd. My posing and confidence has improved dramatically and it brings out my best features. What I love about Johanna is her programmes are custom designed to me and not run of the mill programs. She takes into consideration my goals, my weakness, injuries, likes and dislikes. Johanna’s programs very easy to follow. She spends an hour explaining each program, exercises, sets, reps etc. She will also send a video if you are unsure of correct technique. I have made insane muscle gains in the year I have been working with Johanna. She has taken me from being an amateur bikini girl who was not making any progress to the top Wff Bikini Pro in New Zealand. I cannot recommend Johanna enough! I’ve worked with many different coaches throughout my life. I have been doing bodybuilding for 3 years now. Johanna is the third coach I have and by FAR the Best! I love her no-fluffing-around approach but at the same time extremely supportive! Her methods, expertise and love for the sport and her athletes is incomparable! She not only makes sure her individualised programs are going to deliver incredible results but also that they fit you and your lifestyle so you don’t burn out and you actually enjoy them. Johanna is also a fantastic posing coach. Her attention to detail is amazing. Strong and feminine, beautiful and musically correct. I love working with Johanna because I know I can trust her 100%. Especially when I lose sight in the prep process. Her judgment abilities to see what’s best for me during peak week are a true gift for all the clients who work with her! She not only brings the best out in me, when I’m on stage but also every single day on the gym floor. My workouts are always intensity and intention packed. Not only my body has transformed significantly since I’ve started working with Jo but also the way I feel and my attitude towards the hard work and commitment! I discovered Johanna online via Instagram and Facebook as I was searching for a local coach. The challenge was on for Johanna. I had decided to aim for a show and then suffered some personal setbacks which stalled my training progress. I needed help and as my past experiences had been solely online coaching. I thought I would try to find someone local who could do more face to face training. My final prep time was less than 8 weeks. Johanna’s programme was full on and absolutely rocked from start to finish! She was incredibly supportive and understanding but also kept me focused on my goal which was what I really needed. I’m a behavioral psychologist so know all about the science of behavior change but the hardest part is applying it to yourself! My original journey into body building began as a challenge to change my behavior so it’s been great to work with someone who applies tons of positive reinforcement, and behavioral technologies such as modeling and giving immediate feedback during practice sessions. Johanna you rock, and I am so grateful to you for extending me and my body even further! Here’s to the next event! I discovered Johanna online via Instagram and Facebook as I was searching for a local coach. The challenge was on for Johanna. I had decided to aim for a show and then suffered some personal setbacks which stalled my training progress. I needed help and as my past experiences had been solely online coaching. I thought I would try to find someone local who could do more face to face training. My final prep time was less than 8 weeks. Johanna’s programme was full on and absolutely rocked from start to finish! She was incredibly supportive and understanding but also kept me focused on my goal which was what I really needed. I’m a behavioral psychologist so know all about the science of behavior change but the hardest part is applying it to yourself! My original journey into body building began as a challenge to change my behavior so it’s been great to work with someone who applies tons of positive reinforcement, and behavioral technologies such as modeling and giving immediate feedback during practice sessions. Johanna you rock, and I am so grateful to you for extending me and my body even further! Here’s to the next event! Johanna has been my coach for 14 months now! I am absolutely thrilled I started with her. I have seen the best results and I absolutely love the programming. every 5 weeks I get a new program customized to my body. After a few programs, Johanna offered to sponsor me, and I feel so incredibly lucky to have her by my side through this crazy journey! Johanna coaches me for training, posing and my routine, but also offers valuable advice from her own personal experiences. Johanna's help is absolutely priceless and I wouldn't hesitate to recommend her. Johanna is the best in the business." I first started seeing Jo last year when I was looking for help and direction with getting involved with bodybuilding. Ever since I first started getting into fitness one of my goals was to always one day get onto that stage and compete in a federation. My first issue was I had no idea where to even start or what I needed to do to prepare for such an event! One of my very close friends and also a trainer told me to get in touch with Jo for guidance and posing practice as I said to myself from day one if I was to compete I would do it properly and commit to it 100%! I purchased the complete package that Jo advertises which includes one on one coaching sessions and also a personal routine made especially for you! So this was exactly what I wanted for my first ever show! I have a Universe winner as my Coaching mastermind! Perfect situation! In 2013 I competed at the WFF Southern Hemispheres and, while getting ready, in walks this amazing body, seriously jaw-dropping! As soon as she spoke I recognised the Kiwi accent and I had to introduce myself. That was my first encounter with Jo Mountfort and she made a huge impression on both myself and my husband. The reason is easy – she was just such a beautiful person to speak with. Bubbly, inviting and so cheerful. I couldn’t help but be drawn to her and following that comp I started following her amazing achievements on social media. For anyone looking to achieve their best results ever, I would recommend Jo! If you want to be the best you can, get Jo !